Adamu Sambo, Dakar: President Muhammadu Buhari is in Dakar, Senegal ahead of the 3rd international Forum on peace and security beginning on Tuesday. 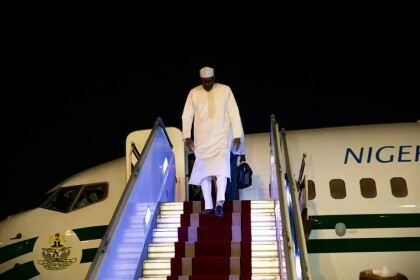 President Buhari arrived Leopold Sedar Senghor International Airport at bout 8 o’clock in the evening local time. President Macky Sall of Senegal led his countries high powered delegation to give the Nigerian leader a befitting reception on his first official visit to the West African Country since coming to power. President Buhari is expected to join other Afican leaders at the Peace and security Forum convened by President Macky Sall in collaboration with the African Unoin to discuss security related challenges affecting the continent. The President who has identified improved security in Nigeria as a priority for development shares the vision of the Forum In finding solutions to among others terrorism, violent extremism, piracy, drugs and human trafficking. The theme of the two days forum is Afica and its Security Challenges, perspectives for Effecutive solutions. President Buhari is being accompanied on the visit by Governors Ibrahim Geidam of Yobe State and Godwin Obasaki of Edo State, Minsters of Defence, Foreign Affairs and Interior as well as the National Security Adviser.